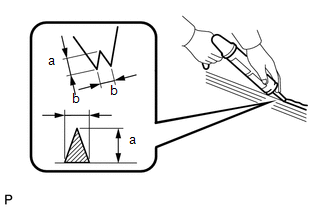 (a) Apply Primer G to the installation part of the No. 2 back window glass spacer. If primer is applied to an area that is not specified, wipe off the primer with a non-residue solvent before it dries. (b) Install a new No. 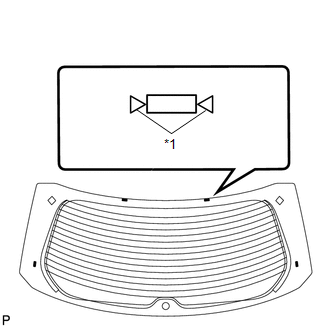 2 back window glass spacer onto the back door glass, as shown in the illustration. 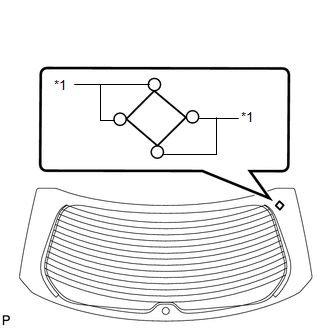 RH and LH spacers are different parts. (a) Apply Primer G to the installation part of the back window glass spacer. 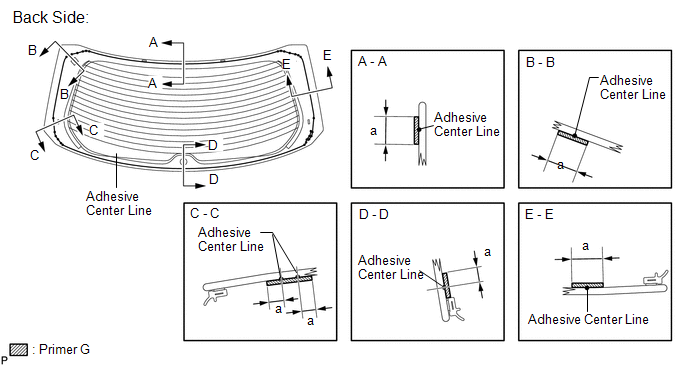 (b) Install 4 new back door glass spacers onto the back door glass, as shown in the illustration. 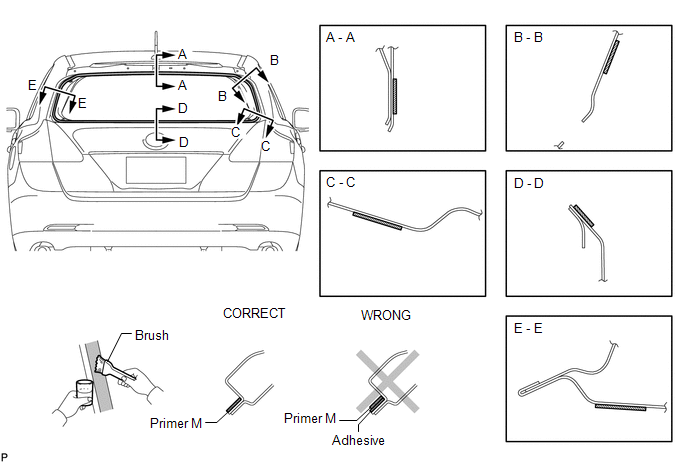 (a) Using a brush, coat the installation surface on the vehicle body with Primer M.
(b) Using a brush or a sponge, coat the application area of the adhesive with Primer G.
(c) Apply adhesive to the back door glass. 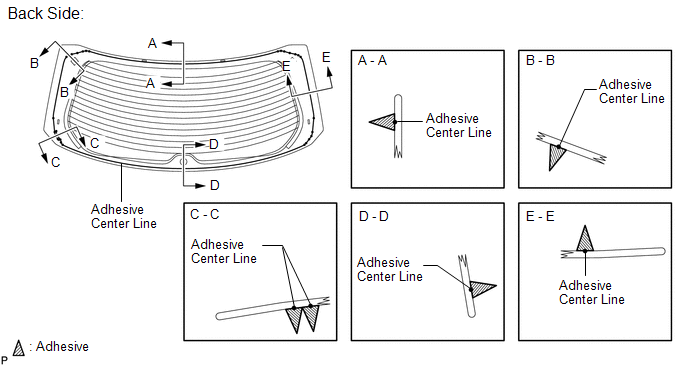 After cutting off the tip, use all the adhesive within the time described in the table below. 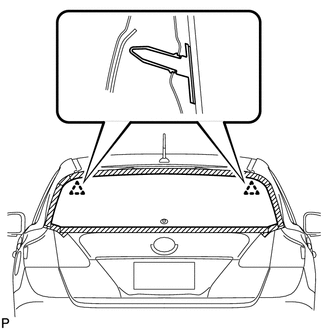 (3) Apply adhesive to the back door glass as shown in the illustration. (d) Install the back door glass. (1) Position the back door glass so that the matchmarks are aligned, and press it in gently along the rim (when glass without a clip is used). 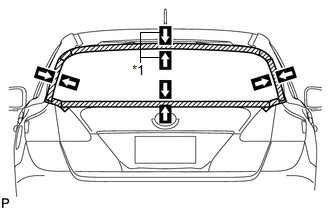 (2) Lightly press the back door glass to ensure that the back door glass is securely fit to the vehicle body (when glass without a clip is used). (3) Using suction cups, engage the 4 clips to install the back door glass (when glass with all clips is used). Check that the clips are attached to the vehicle body correctly. Check the clearance between the vehicle body and back door glass. 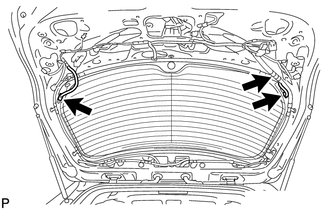 (4) Lightly press the front surface of the back door glass to ensure that the back door glass is securely fit to the vehicle body. Press the back door glass with a force of 98 N (10 kgf, 22 lbf) or more. (5) Using a scraper, remove any excess or protruding adhesive. 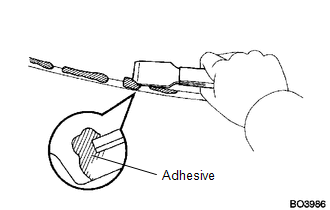 (6) Hold the back door glass using protective tape until applied adhesive becomes hard.